Just this morning, the 11th of May 2017,a reliable source from Kuje prison Abuja called the desk of Family Writers Press in a very worrisome manner. 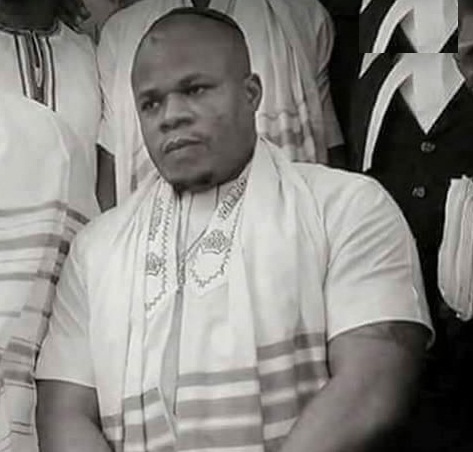 The caller who chose to remain anonymous , reported that the lives of Biafran activists, who have been detained unlawfully for years now alongside Mazi Nnamdi Kanu are in great danger, especially Mazi Benjamin Mmadubugwu. "Are you the brother of one Mr. Benjamin Mmadubugwu, Nnamdi Kanu's co defendant?" the caller asked curiously. "hmmm!,I'm sorry but I have to tell you the truth, the way I'm seeing things going on now that Mazi Nnamdi Kanu is not with them,I'm afraid you guys may end up losing all of them. More especially, the life of Mr. Benjamin Mmadubugwu who depends on inhalers in order to sustain his life presently". "Stop asking like you don't know, Benjamin has been infected of Asthma even right from his incarceration at DSS custody of which the result was also known to him. But as for the last few days,the asthma is turning to something else,and I'm very sorry to say that if you people continue keeping mute,waiting for the prison management, you guys may end up losing him at last. Even that one called David, in fact, none of them is save". Remember that in August 2016, the Kuje prison management tear-gassed Mazi Nnamdi Kanu and co defendants in an attempt to get them assassinated. And ever since , Mazi Benjamin Mmadubugwu who has been confirmed as asthmatic, has not taken proper medical care. Also, few days ago, Mazi Benjamin's food was poisoned. And there are speculations that the Hausa/Fulani prison management over there vowed to kill him. The reason being that, "he carries BIAFRA on his head more than any of the four ", according to them. Therefore, we are calling on the International Community, Human Right groups, lovers of freedom and democracy to intervene on this worrisome condition. For the fact that they are asking for Biafra does not mean they should be killed. They are not criminals. Nigeria must released them and every other incarcerated Biafran unconditionally without tempering with their lives. Any attempt to poison any of them through whatever means will spell doom for Nigeria.